Worked top down in one piece, this ‘big collar’ shrug closes with one large button. Sleeves are worked from shoulder to cuff in rounds, and fitted shoulders and area above hem are worked back and forth with optional short row shaping. There is a decrease panel down top of sleeves and at underarm, for a more tailored fit. Folded cuffs are deep to compliment the big collar. 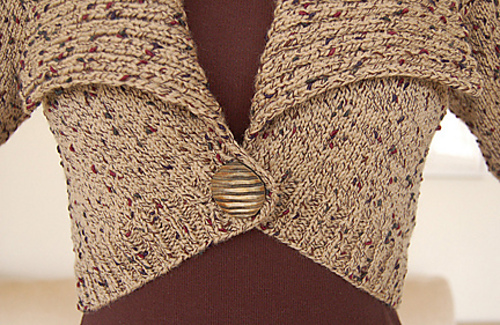 This pattern is easy without short rows at shoulders and at left and right front. 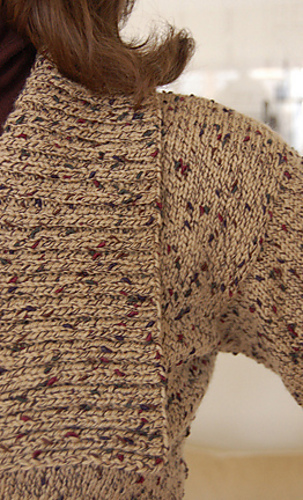 With short rows it is intermediate; without short rows at left and right front, the waistline will be straight, not curved.